ENCINITAS — The blanche wall against the 7-Eleven market in Downtown Encinitas might look like a plain white wall, but to Micaiah Hardison, he sees Encinitas. On one end of the wall, he sees an image of Leucadia, looking south toward Swami’s State Beach. On another end, a view of Cardiff looking north toward the same landmark. At the center of the wall, he sees Swami’s beach, bathed in the glow of a sunset, a panga off the coast full of immigrants. You can go to the beach at sunset, and it’s totally unified, whether you are a billionaire or living in a van, Hardison said. Everybody’s equal at sunset. This, he said, is his image of Encinitas, and it is the inspiration for the mural that will adorn the wall in a little over a week. Hardison, who previously had a mural on the same wall for 14 years, is working with Paint Encinitas to breathe life back into the wall, and will unveil his mural at 2 p.m. Jan. 17. Two of the panels — the views of Leucadia and Cardiff — are already completed on large panels, and will be installed before the ceremony. Hardison, 36, will finish painting the center of the mural by Friday, when it will be covered up until the unveiling ceremony. 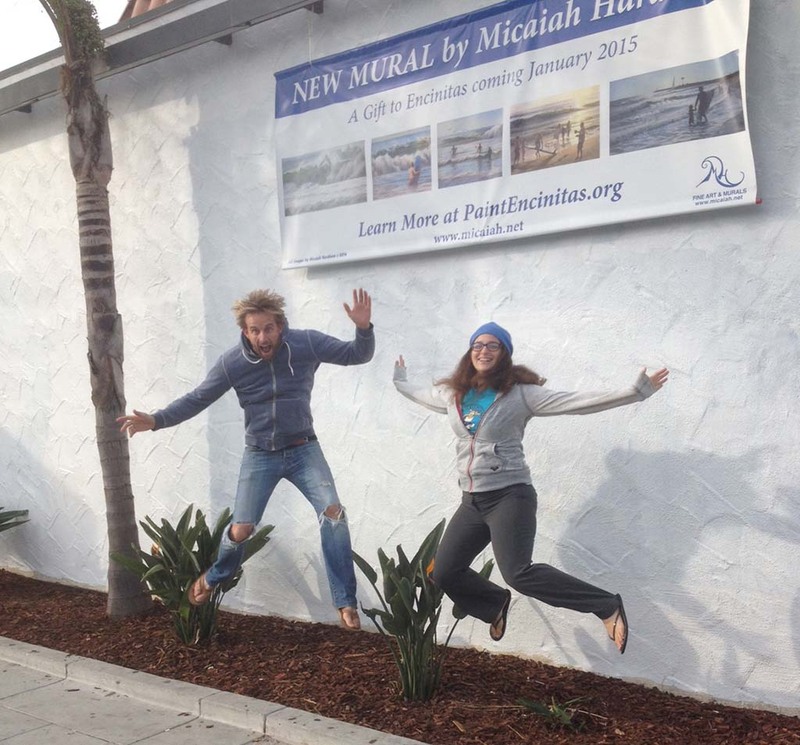 Hardison said he had been considering redoing the mural for quite some time, but credits Jax Meyers, the founder of Paint Encinitas, for the necessary push. Call it structured motivation, they said. About two years ago, I realized that I had outgrown the previous mural and I wanted to change it, but it was hard to get around to it, so it was one of those things that kept getting postponed, Hardison said. Then one day a few months ago, Jax said, ‘Hey, we want this done,’ and I asked her to give me a deadline, and the rest is pretty much history. The mural, which will include some carpentry that will bind the panels and the painting together, costs about $15,000, Meyers said. Several businesses, including SoulScape Gift & Bookstore, Detour Salon and 7-Eleven, have contributed to the project, and Meyers is hoping to raise the rest with in-kind donations. Meyers has led a recent charge to promote and create murals across the town, creating a virtual public art gallery accessible to all, regardless of means. She said that the 7-Eleven wall is a critical facade that is visible to thousands who visit downtown. A passionate sort when it comes to the importance of the arts to the community, Meyers said projects such as Hardison’s inspire more than just the children.